› Chain / Bar Length: 35cm / 14"
The Cobra CS3540VZ 40v cordless chainsaw is built to tackle the most demanding jobs. Whether you're pruning or cutting firewood, the CS3540VZ with 14" Oregon bar and chain is up to the job. The Cobra CS3540VZ is fitted with a 35cm / 14" Oregon bar and chain, the world's leading manufacturer and marketer of cutting chain and guide bars for chainsaws. Known for its innovative spirit, the company focuses on manufacturing products that offer a superior competitive advantage and so fits perfectly with Cobra chainsaws. 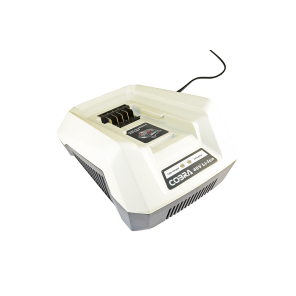 Cobra's 40v Li-ion system consists of a range of 3 Lawnmowers that come complete with 1 or 2 batteries and 3 handheld garden tools. 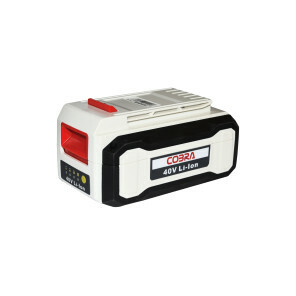 All Lawnmowers and garden tools in this range can be powered from a standard 40v Samsung battery and charger. The Cobra CS3540VZ comes equipped with a quick chain tensioning system which eliminates the need for any tools for tightening the chain. Just a quick rotation of the tensioning wheel and you'll be back in action without any down time. Cobra cordless chainsaws are packed with innovative and features to help you create the perfect garden with minimum effort. Chain / Bar Length: 35cm / 14"